Disclaimer This was put here only just incase some one is all ready doing these kinds of drills or ideas. I credit many people and material that I have. 1 Disclaimer This was put here only just incase some one is all ready doing these kinds of drills or ideas. I credit many people and material that I have read and just put it together into a system that works for us. Many of you might all ready use some of this material. We just put it together in a way for our kids to learn. This method I think will work with any offense and rules for blocking, it might even work for defense to. Please let me no if you are doing these drills or ideas and how they help you. 3 Our Team First just let me tell you about our team and situation. We are a small school in northeast connecticut.We are the smallest school in the state playing football. The school once had a great program but due to budget and other factors it went to rock bottom. The team did not even field a team 3 years ago.This is remarkable considering it won the state title in the small division a few years back. Well coming in this year as new coaches we were faced with many challenges. One we only had 18 upper classman,( soph- seniors) and we had 23 freshman.We had only 5 seniors total and 2 had never played before. What to do ? 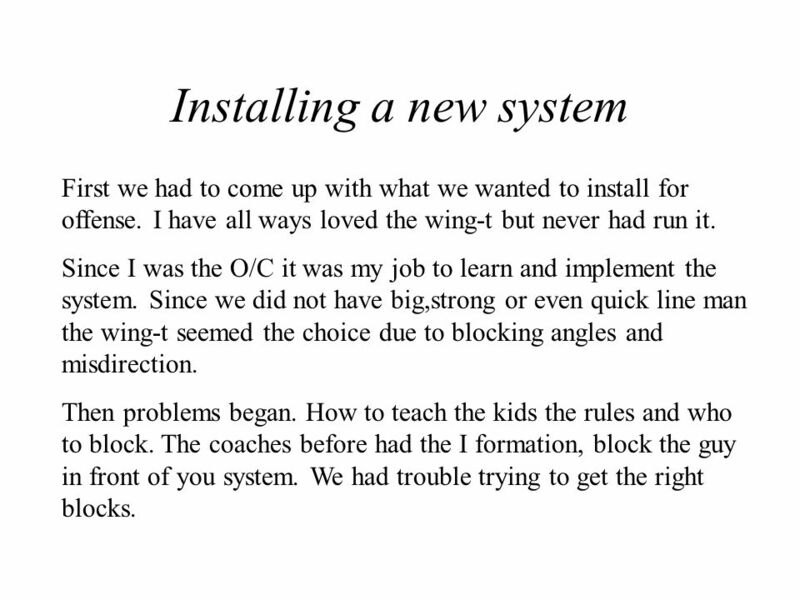 4 Installing a new system First we had to come up with what we wanted to install for offense. I have all ways loved the wing-t but never had run it. Since I was the O/C it was my job to learn and implement the system. Since we did not have big,strong or even quick line man the wing-t seemed the choice due to blocking angles and misdirection. Then problems began. How to teach the kids the rules and who to block. 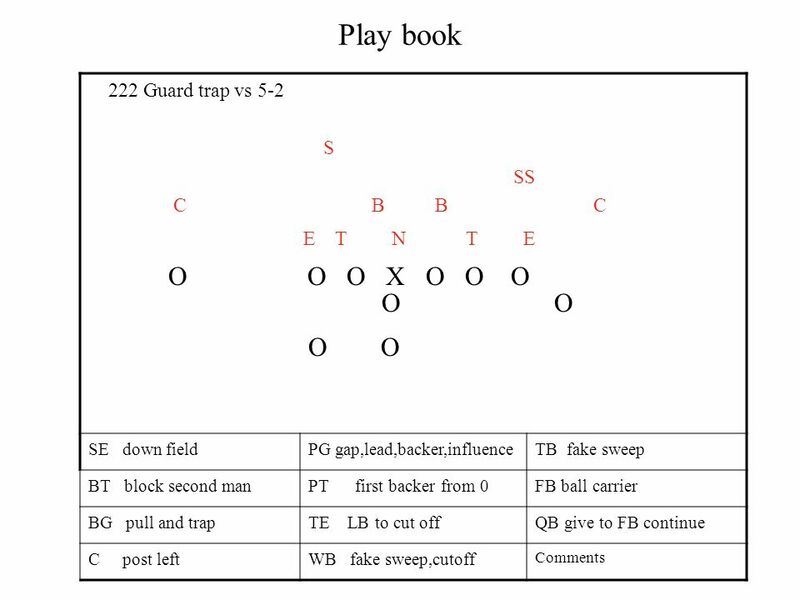 The coaches before had the I formation, block the guy in front of you system. We had trouble trying to get the right blocks. 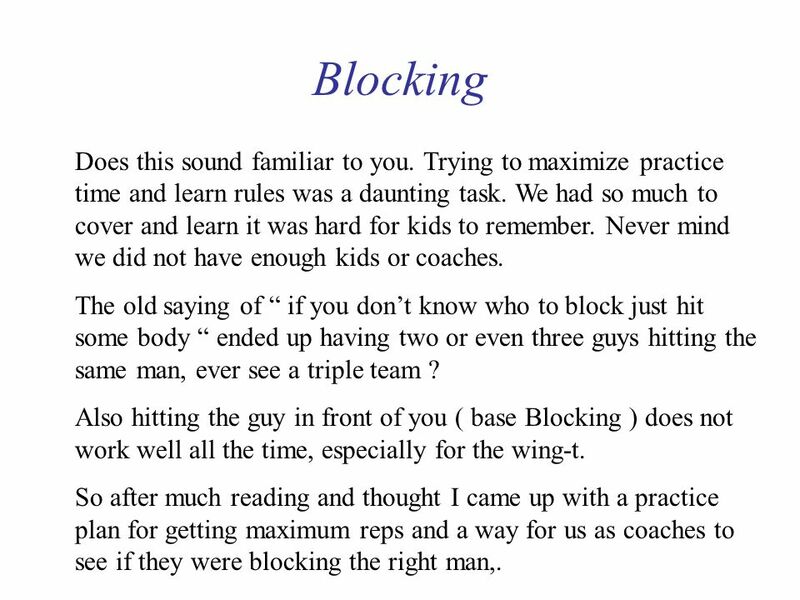 5 Blocking Does this sound familiar to you. Trying to maximize practice time and learn rules was a daunting task. We had so much to cover and learn it was hard for kids to remember. Never mind we did not have enough kids or coaches. The old saying of if you dont know who to block just hit some body ended up having two or even three guys hitting the same man, ever see a triple team ? Also hitting the guy in front of you ( base Blocking ) does not work well all the time, especially for the wing-t. 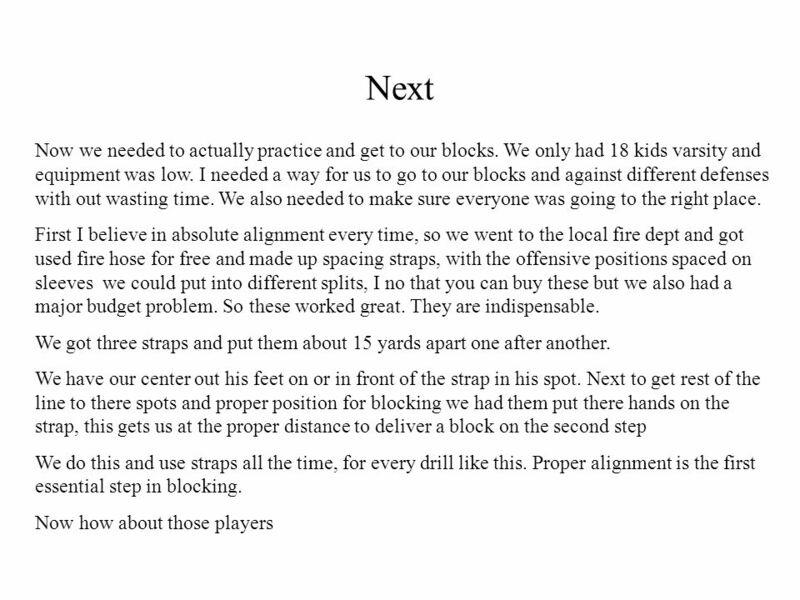 So after much reading and thought I came up with a practice plan for getting maximum reps and a way for us as coaches to see if they were blocking the right man,. 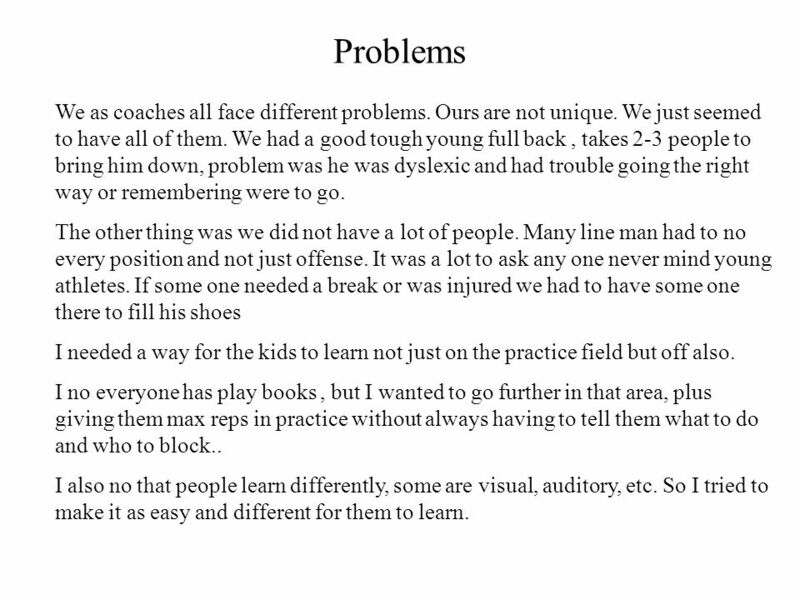 6 Problems We as coaches all face different problems. Ours are not unique. We just seemed to have all of them. We had a good tough young full back, takes 2-3 people to bring him down, problem was he was dyslexic and had trouble going the right way or remembering were to go. The other thing was we did not have a lot of people. Many line man had to no every position and not just offense. It was a lot to ask any one never mind young athletes. If some one needed a break or was injured we had to have some one there to fill his shoes I needed a way for the kids to learn not just on the practice field but off also. I no everyone has play books, but I wanted to go further in that area, plus giving them max reps in practice without always having to tell them what to do and who to block.. I also no that people learn differently, some are visual, auditory, etc. So I tried to make it as easy and different for them to learn. 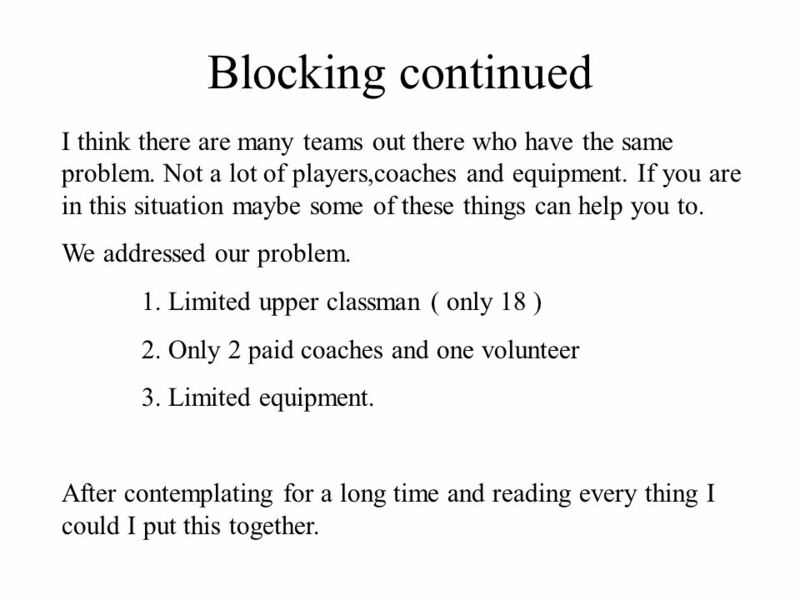 7 Blocking continued I think there are many teams out there who have the same problem. Not a lot of players,coaches and equipment. If you are in this situation maybe some of these things can help you to. We addressed our problem. 1. Limited upper classman ( only 18 ) 2. Only 2 paid coaches and one volunteer 3. Limited equipment. After contemplating for a long time and reading every thing I could I put this together. 8 Thoughts First I myself hate using kids as dummies or live blocking bags. First we did not have enough kids and I hate having kids standing around to long holding hand shields etc. How do they get to learn? There is a time and place for that in technique period, not learning period. Worse is putting freshman in that spot, they need there own learning also and there is only so much time. As I said we had only 2 coaches and not a lot of equipment or players. As a coach how can we keep an eye on everyone and make sure they are going to there right assignment? More on that later. 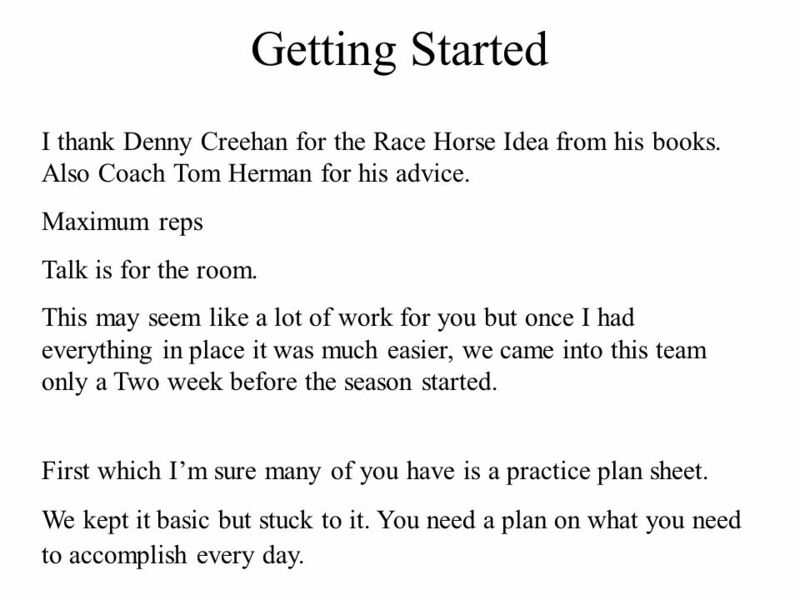 9 Getting Started I thank Denny Creehan for the Race Horse Idea from his books. Also Coach Tom Herman for his advice. Maximum reps Talk is for the room. This may seem like a lot of work for you but once I had everything in place it was much easier, we came into this team only a Two week before the season started. 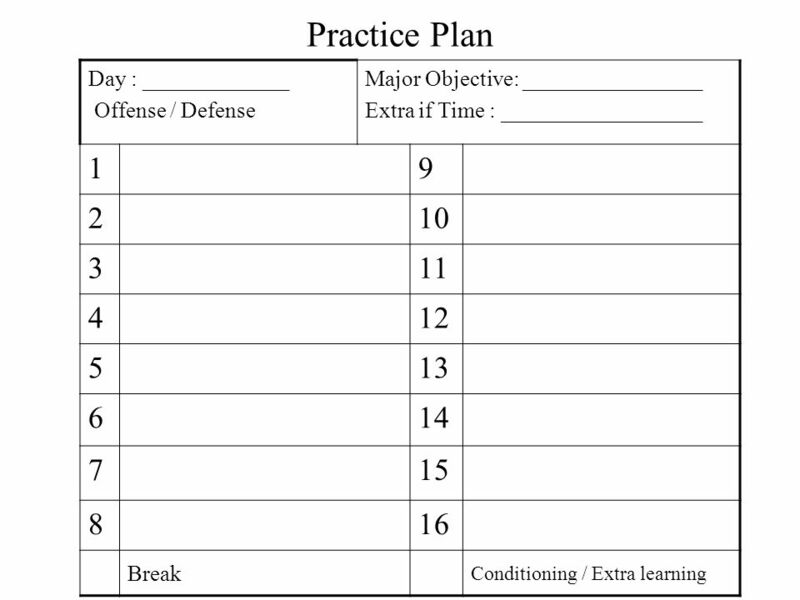 First which Im sure many of you have is a practice plan sheet. We kept it basic but stuck to it. You need a plan on what you need to accomplish every day. 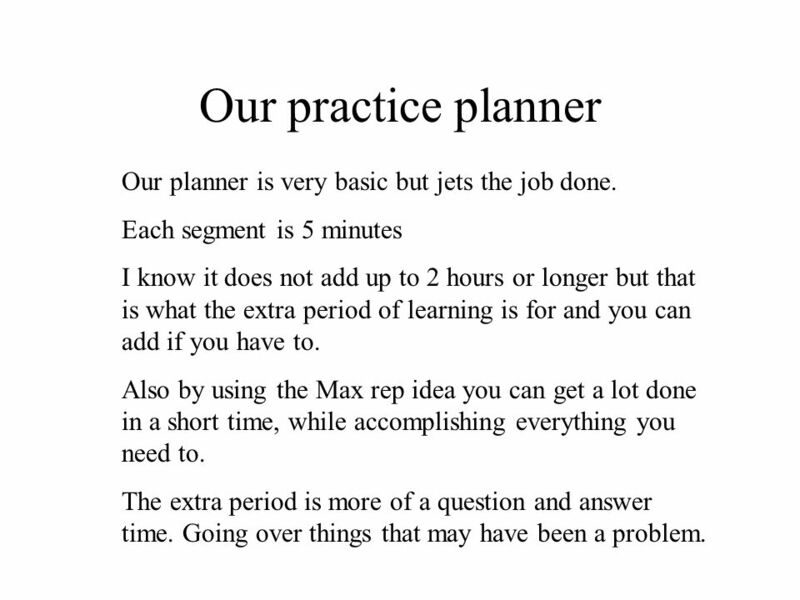 10 Our practice planner Our planner is very basic but jets the job done. Each segment is 5 minutes I know it does not add up to 2 hours or longer but that is what the extra period of learning is for and you can add if you have to. Also by using the Max rep idea you can get a lot done in a short time, while accomplishing everything you need to. The extra period is more of a question and answer time. Going over things that may have been a problem. 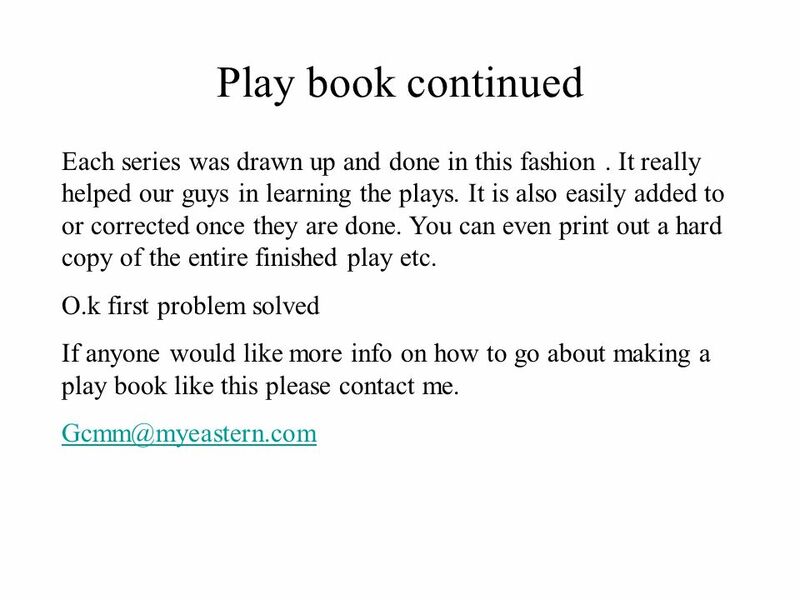 12 Play books I no we all have play books and we are no different. I just went one step further and put it on CD also, knowing that kids and computers go hand and hand. 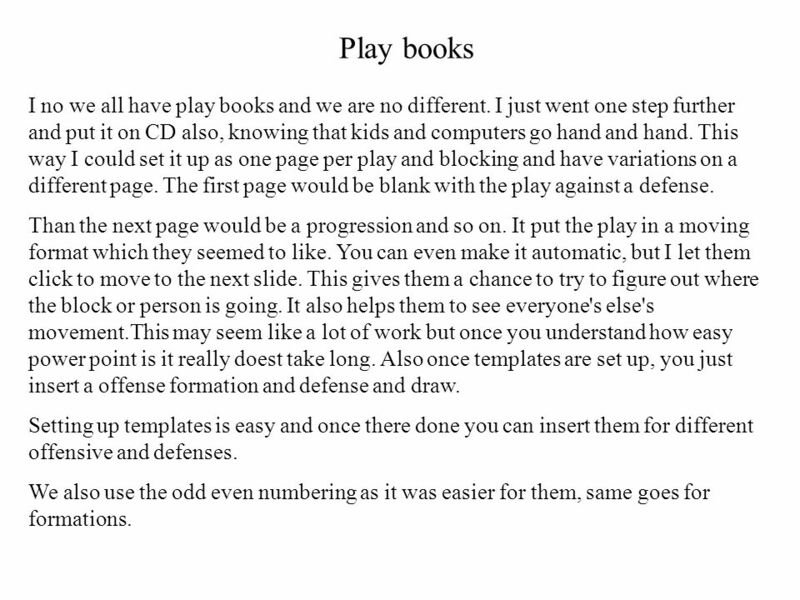 This way I could set it up as one page per play and blocking and have variations on a different page. The first page would be blank with the play against a defense. Than the next page would be a progression and so on. It put the play in a moving format which they seemed to like. You can even make it automatic, but I let them click to move to the next slide. This gives them a chance to try to figure out where the block or person is going. 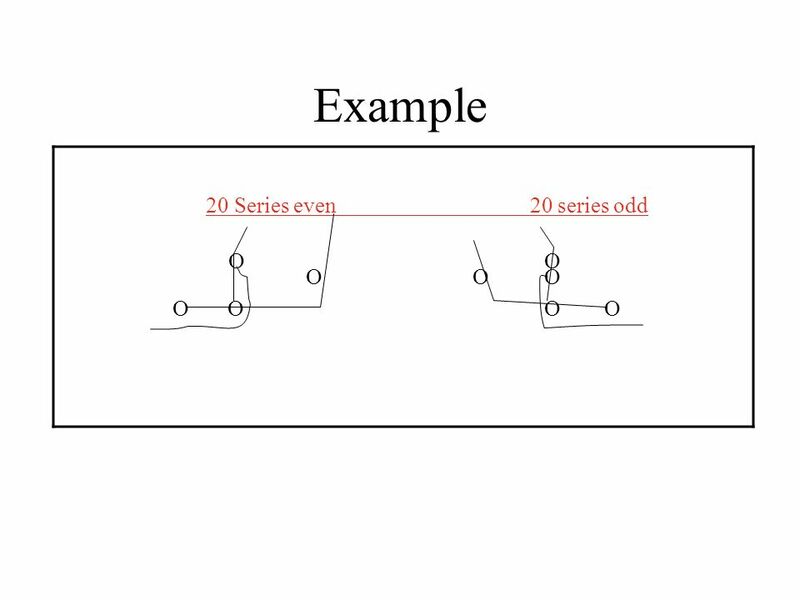 It also helps them to see everyone's else's movement.This may seem like a lot of work but once you understand how easy power point is it really doest take long. Also once templates are set up, you just insert a offense formation and defense and draw. Setting up templates is easy and once there done you can insert them for different offensive and defenses. We also use the odd even numbering as it was easier for them, same goes for formations. 26 Next the line Now on to the line and getting max reps against defenses. Again as a learning tool and getting rid of the players asking another player who to block or what is my rule I just did the same thing for them. 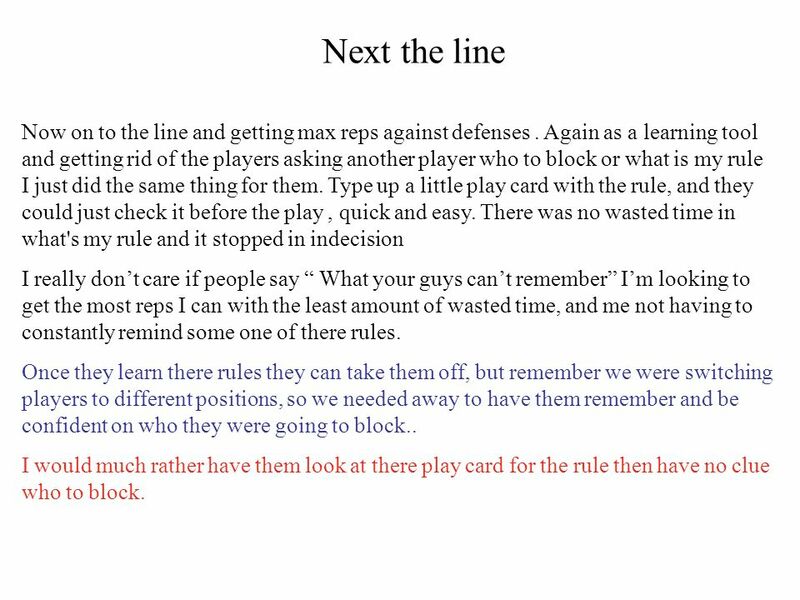 Type up a little play card with the rule, and they could just check it before the play, quick and easy. There was no wasted time in what's my rule and it stopped in indecision I really dont care if people say What your guys cant remember Im looking to get the most reps I can with the least amount of wasted time, and me not having to constantly remind some one of there rules. Once they learn there rules they can take them off, but remember we were switching players to different positions, so we needed away to have them remember and be confident on who they were going to block.. I would much rather have them look at there play card for the rule then have no clue who to block. 27 Continued Now we could just call a play, get up to the line and go, or even right at the line, remember we are working on learning our assignments not technique. 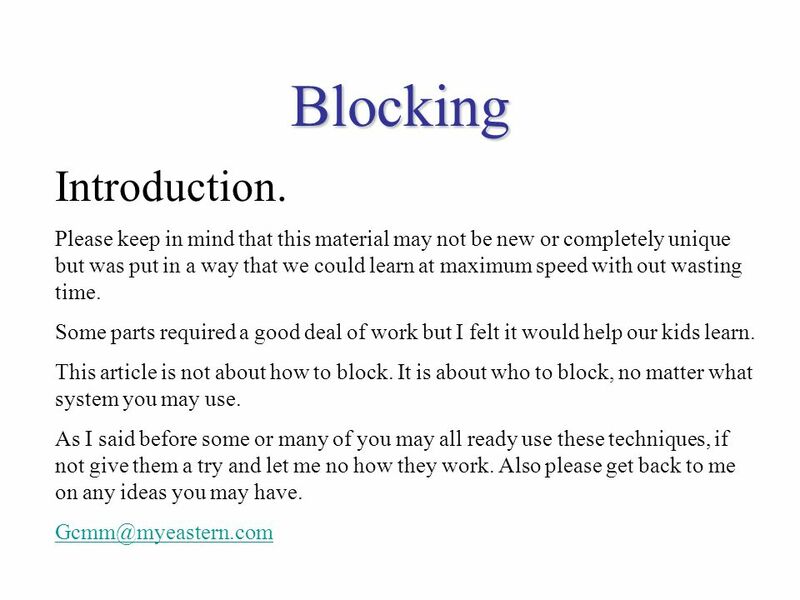 Now the other learning tool I used was to make a quick time video/dvd of me explaining the rules and showing the blocks. I just did a video of me in front of my NEW PLAYERS ( next to Come ). The players were able to take them home and view them and learn there assignments. Again this may seem like a lot of work for a coach to do, but isnt it our job to teach them and help them learn. Remember I was using the principle that learning is different for everyone. 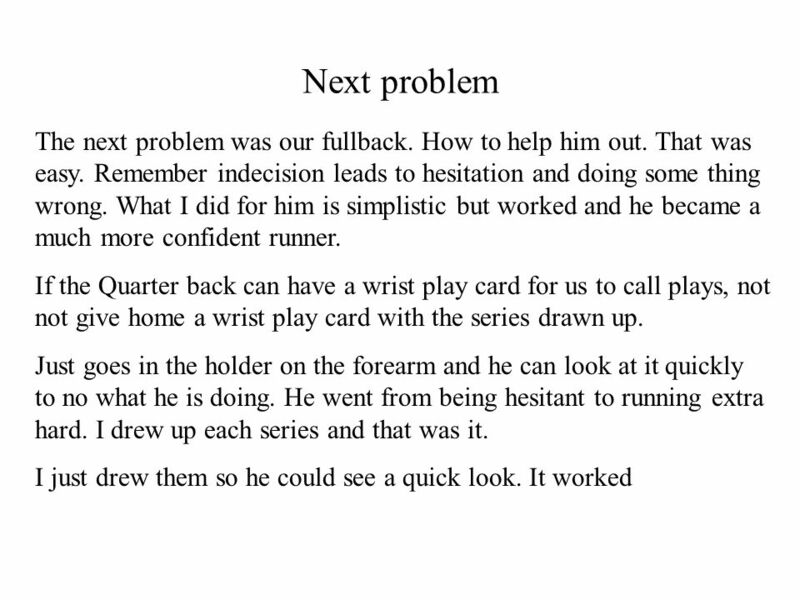 By using animated play books,video and play cards my guys learned very quickly and with confidence. Isnt that what it is all about. 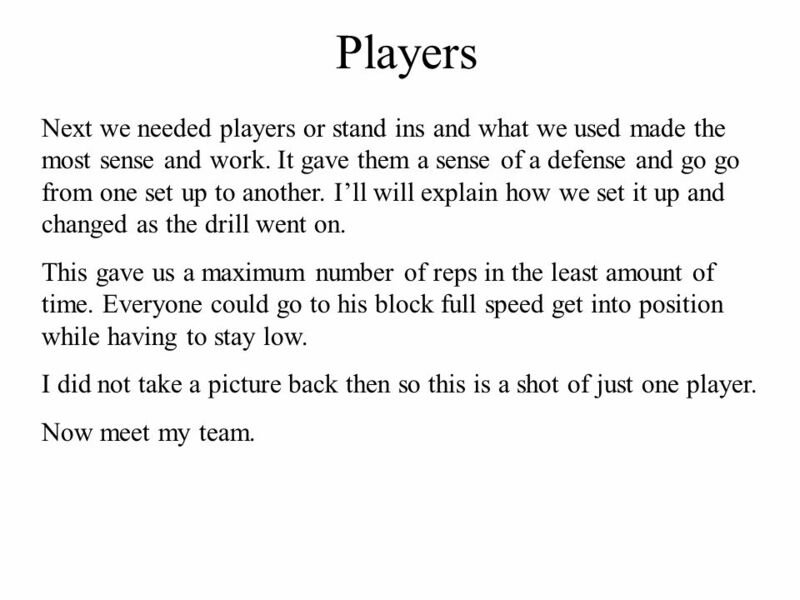 29 Players Next we needed players or stand ins and what we used made the most sense and work. It gave them a sense of a defense and go go from one set up to another. Ill will explain how we set it up and changed as the drill went on. This gave us a maximum number of reps in the least amount of time. Everyone could go to his block full speed get into position while having to stay low. I did not take a picture back then so this is a shot of just one player. Now meet my team. 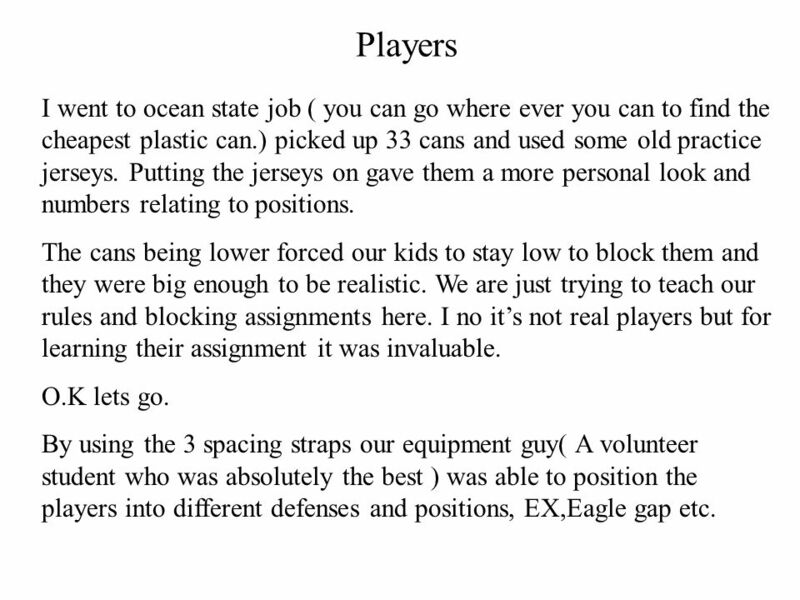 31 Players I went to ocean state job ( you can go where ever you can to find the cheapest plastic can.) 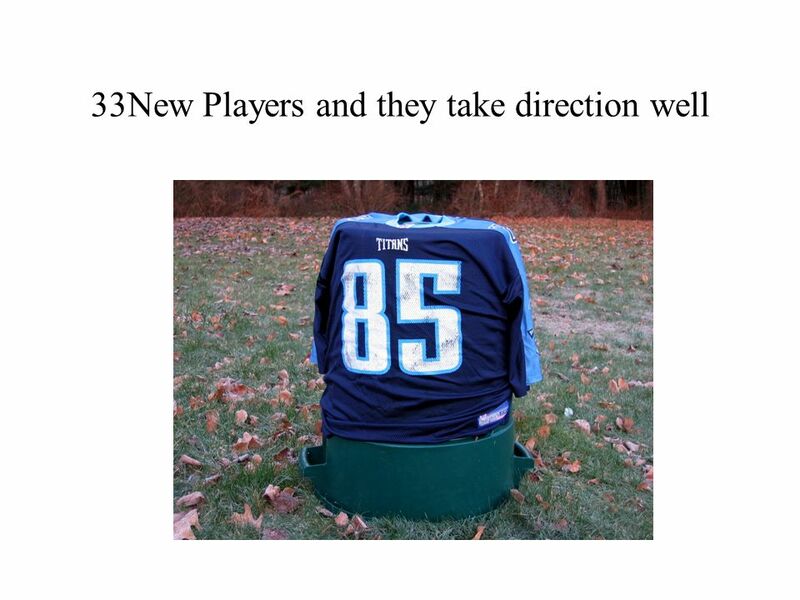 picked up 33 cans and used some old practice jerseys. Putting the jerseys on gave them a more personal look and numbers relating to positions. The cans being lower forced our kids to stay low to block them and they were big enough to be realistic. 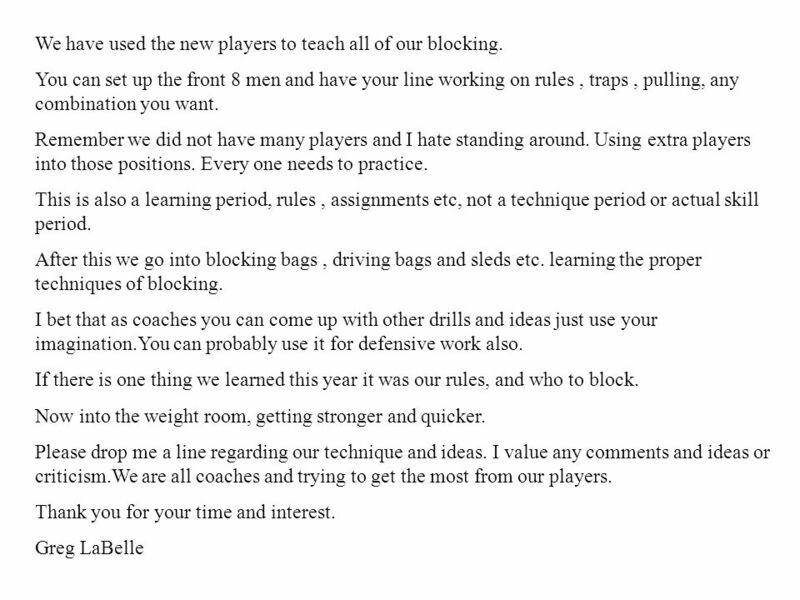 We are just trying to teach our rules and blocking assignments here. I no its not real players but for learning their assignment it was invaluable. O.K lets go. By using the 3 spacing straps our equipment guy( A volunteer student who was absolutely the best ) was able to position the players into different defenses and positions, EX,Eagle gap etc. 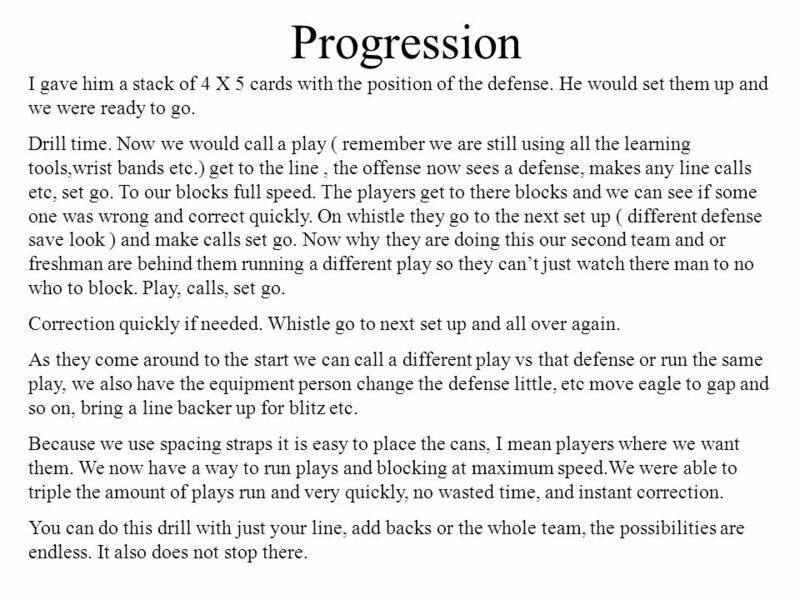 32 Progression I gave him a stack of 4 X 5 cards with the position of the defense. He would set them up and we were ready to go. Drill time. Now we would call a play ( remember we are still using all the learning tools,wrist bands etc.) get to the line, the offense now sees a defense, makes any line calls etc, set go. To our blocks full speed. The players get to there blocks and we can see if some one was wrong and correct quickly. 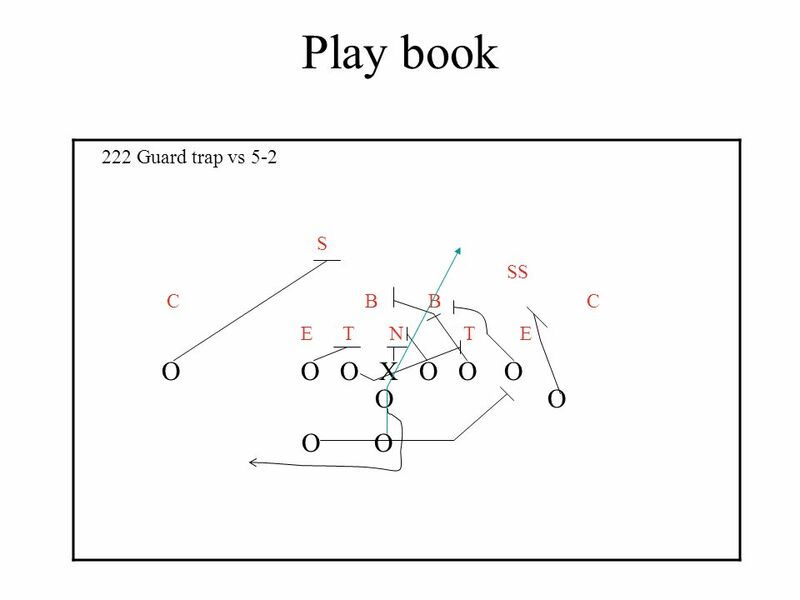 On whistle they go to the next set up ( different defense save look ) and make calls set go. Now why they are doing this our second team and or freshman are behind them running a different play so they cant just watch there man to no who to block. Play, calls, set go. Correction quickly if needed. Whistle go to next set up and all over again. As they come around to the start we can call a different play vs that defense or run the same play, we also have the equipment person change the defense little, etc move eagle to gap and so on, bring a line backer up for blitz etc. Because we use spacing straps it is easy to place the cans, I mean players where we want them. We now have a way to run plays and blocking at maximum speed.We were able to triple the amount of plays run and very quickly, no wasted time, and instant correction. You can do this drill with just your line, add backs or the whole team, the possibilities are endless. It also does not stop there. 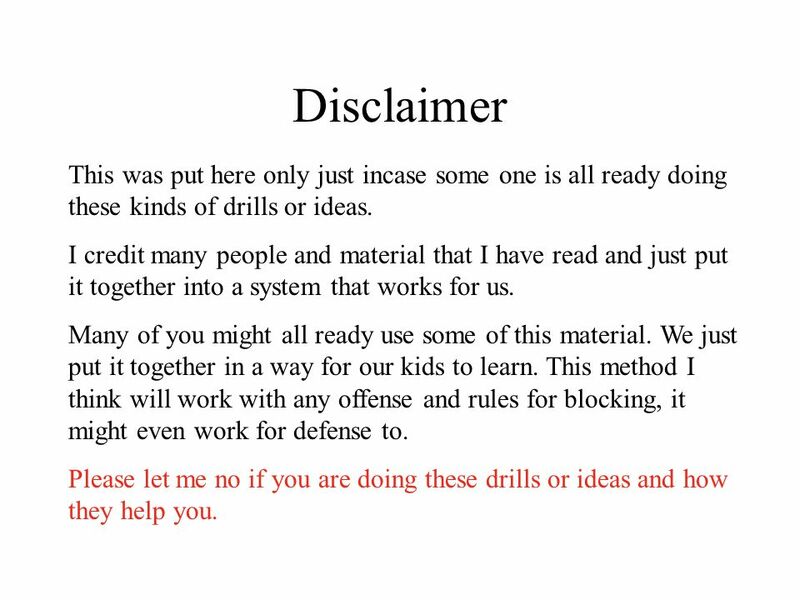 Download ppt "Disclaimer This was put here only just incase some one is all ready doing these kinds of drills or ideas. I credit many people and material that I have." Project Steps We started by… – Researching what we would need – Purchasing what we would need Next… – We waited for supplies to arrive in the mail – We. DURHAM WAR EAGLES 2-ON-1 TACKLING DRILL (Tee Time) Ball-Carrier is on his back. Tacklers stand behind their cone. On the signal, ball-carrier gets up and. Address Your posture looks pretty good here. Basically, with perfect posture, that line I drew should go through the balls of your feet, the tips of your. Line Change Procedure Start line change as soon as it is safe to do so Make sure that you are visible to the benches Make eye contact with the visiting. 1 Taking Notes. 2 STOP! Have I checked all your Source cards yet? Do they have a yellow highlighter mark on them? If not, you need to finish your Source.